Richard Sheridan who is running for mayor in Dallas, TX has been charged with vandalizing 2 gay landmark statues the Legacy of Love Monument (above) and the Cathedral of Hope last June. 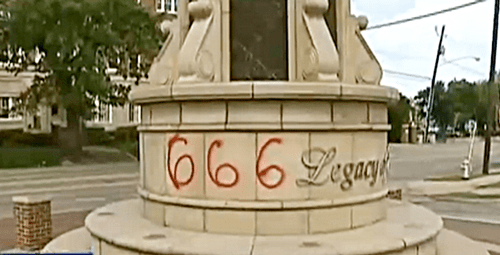 The monuments,in the heart of Dallas’ gayborhood, and the church — known as the world’s largest LGBT congregation — were among 12 sites in the city there were vandalized with “the number of the beast” 666 spray-painted in red paint. Sheridan is charged in only two of the incidents. A grand jury indicted Sheridan for a state jail felony, punishable by up to two years behind bars. If prosecutors treat the case as an anti-gay hate crime, the charges could be enhanced to a third-degree felony, punishable by up to 10 years in prison.